You are wasting time, you need to increase rocket production, get the Falcon heavy going and give up, or postpone trying to land on a platform in the water until you have propulsive landings nailed and happening on a regular basis. You are facing more and more competition and they will catch up with you in the next few years unless you pick up the pace. It looks wonderful, however, rocket technology is rather becoming obsolete. Looking at the fundamental technological advancements we ought to look at propulsion systems that are more reliable and efficient. We know try at rockets have limited capabilities in space and that they require refueling when travelling in space. Also, the maximum velocity the system delivers shows a negative value on the scale in terms of the desired results. I suggest you revisit the technologies available. For example, we have valuable information regarding celestial travelling. We know that the Germans said that we can use solar radiation for fuel, why not learn. If you outfit a space ship with a two stage tftr acellerator, you can accumulate solar radiation from space, acellerate it compressing the photons, we are not splitting or bombarding, only compressing and acellerating, once this has been done we eject the light as a wave from the exhaust vents of the engines. What have we just done, one, pulled us forward and two pushed us forward. This fu is abundant and works on both earth as in space. How you never could have figured his out shocks me. I’m doing this study and have contacted NASA on this. To be honest, rocket propulsion as you use it is outdated even though you use the more modern methods, designs and technology, its the same as fossil fuel consumption. The true energt producing methods exist but you keep on digging because you are ignorant, the same with space travel. We can move in excess.of the speed of light in space, but because some ignorant scientists and engineers said its improbable to them it must be to everyone. Pleas consider my short suggestion. I will be glad.to share the information with you. This system utilises two tftr systems to function. This is what I call warp tech the true way of getting warp speed as shown in Star Trek. Why would SpaceX want to test powered descent in Earth Atmosphere if they won’t be using powered descent in Earth’s atmosphere? Ok, I know that they are going to use it when they go to Mars, but Mars’ atmosphere is different that earth’s. Is this an emergency safety measure, or is it plans for Mars’ powered crew descent? I mean, if NASA is ordering a mission to the ISS, why doesn’t SpaceX use this opportunity to test their landing system? It would give SpaceX data that would help their powered landing system, and give the crew a feel for what the landing would be like. Is there something that I am missing here? I like the image you used in this blog because it shows what the spacecraft looks like and gives a good idea of how it works. Also when would you be using this space craft in a mission? Will you put up an animation of this spacecraft landing? Thanks. It looks good to me. 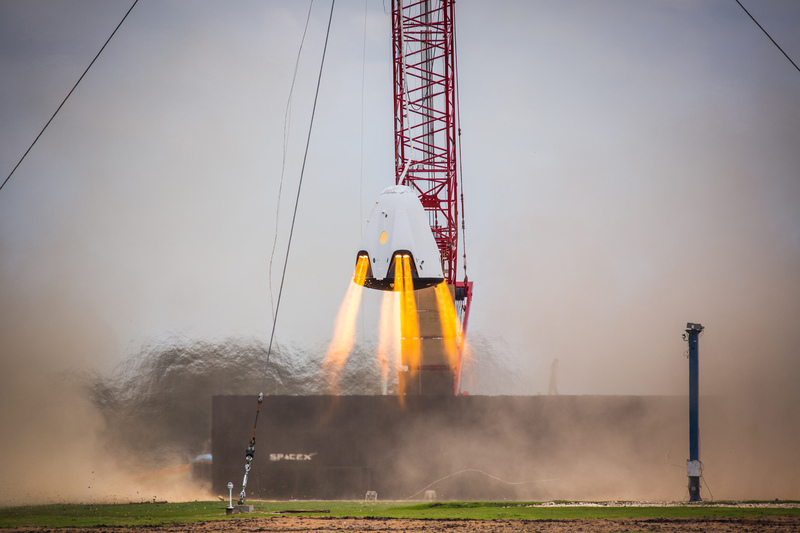 The propulsive landing gives the crew Dragon the ability to land ‘on land’ – the same advantage the Dreamchaser has, with the possibility for a quick return of samples and people, where and if needed. Now, I like the Dreamchaser too, but this way that ability will come sooner and cheaper, even if the prospects of landing a space capsule using propulsion only makes me feel jittery!